Dead last in the NHL in early January, the St. Louis Blues looked like underachievers who cost their head coach his job and wouldn’t remain together for long. Then the Blues did the improbable, winning 30 of their final 45 games to become the seventh team since the expansion era began in 1967 to go from last in the league after New Year’s Day to the playoffs. The transformation didn’t begin Jan. 3, when the team was at the bottom of the standings. St. Louis’ roller-coaster ride started when it missed the playoffs by one point a year ago, rose with offseason additions of Ryan O’Reilly, David Perron, Tyler Bozak and Patrick Maroon, and took a steep drop with the November firing of coach Mike Yeo. Then the steady climb began. 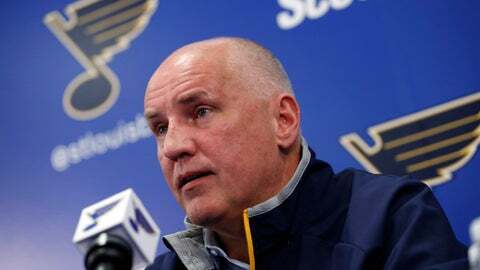 Through a gelling process that took far longer than expected, a transition to interim coach Craig Berube amid the noise of trade speculation and a 70-day stretch spent almost entirely on the road, the Blues became the Stanley Cup contender they were expected to be. They open the playoffs at Winnipeg on Wednesday night. Playoffs? Until mid-January, the Blues didn’t win three straight games. Looking back, general manager Doug Armstrong didn’t bank on how long it would take the team to coalesce with so many new players. The embarrassment of a second midseason coaching change in three years and 22 losses in their first 37 games made for a good start. Then reports surfaced that Armstrong was at least listening on trading just about anyone on the roster from five-time 30-goal-scoring winger Vladimir Tarasenko to 25-year-old defenseman Colton Parayko. The front office and coaching staff noticed improvement in December, but the positive results didn’t start showing until right around the time of goaltender Jordan Binnington’s first start on Jan. 7. The 25-year-old went 13-1-1 in his first 15 starts and gave St. Louis an unexpected boost. It wasn’t just Binnington. Led by O’Reilly, Parayko and captain Alex Pietrangelo, St. Louis became more structured and better defensively under Berube, who finally saw tangible results of molding this group into a heavy, north-south team. Still, the hole was deep and the Blues went over two months until mid-March without playing consecutive home games. Instead of falling apart, the Blues bonded away from home and put together a season-saving, 11-game winning streak. Games during that streak resonate to different members of the Blues. Veteran defenseman Jay Bouwmeester remembers the victory at Anaheim before the All-Star break that gave the team a much-needed “reset.” Armstrong won’t soon forget his team’s third-period comeback at Florida two games later that kept the good vibrations going into an overtime victory at Tampa Bay and a sweep of a home-and-home series against Nashville. Armstrong said he never came close to pulling the trigger on a major trade that would’ve shaken up the core, in large part because it was too far away from the deadline to make such a move. That’s not exactly a ringing endorsement that he didn’t want to make a move but rather an acknowledgement that a fellow GM would have thrown him an anchor rather than a life preserver. Finally playing up to expectations allowed the Blues to finish third in the Central Division, just behind the Jets. Bouwmeester, who signed a $3.25 million extension for next season, considers the Blues underdogs going into the playoffs because they started from the bottom. But now they’re here and look more than capable of making a long run.